SNES Mega Man X2 (USA) "all upgrades" in 31:21.83 by hidaigai. 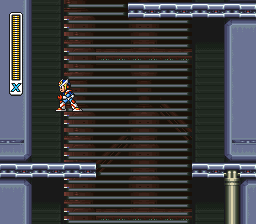 Mega Man X2 makes a particularly interesting run as there are many weapons that can be used to increase mobility. These include a grappling hook, a fast mid-air dash, and a weapon that can transform enemies into platforms. In this movie, hidaigai obtains all of X's upgrades, including the Shoryuken. This makes the ending bosses die almost immediately. This movie is about a 20-second improvement to the previous run in this category by FractalFusion and Graveworm. See the submission comments for more information, along with video links at NicoVideo which provide interesting comparisons between this run and the previous one. This route used to be the fastest way to complete X2, though it has since been beaten by runs that only collect the X-Buster upgrade. (However, many realtime runners are still more likely to use the all-upgrade route.) For even more X2 action, there's another run which doesn't obtain any upgrades and also fights the optional X-Hunters.